Digitronic, Inc. is based in Los Angeles, CA. 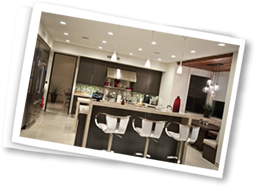 We work with architects, designers, custom builders and home owners providing systems for homes in the Los Angeles area. We provide complete system design as well as provide and install all the equipment for a full turnkey solution. Service is offered after the project is complete and all programming is done in house for an easy path to upgrades and changes in the feature. Ease of use is the most important principle for any electronic system that we design. However, this is the one that most often gets overlooked by other companies. It doesn’t matter how great your audio system sounds like if you have to juggle 5 remote controls or know what your receiver needs to be set at to just watch a movie. If it is simple to use, you will enjoy it a lot more. Reliability means we choose components that we know are high quality and durable. This is essential to reliability as well as the performance. It is important that the systems work the way that you expect them to. Depending upon how you want to use your system and the budget that you have, we can design a system that performs the way you have always dreamed of.